In the last few years, UT-Austin officials pledged $12.5 million a year in scholarships for low- and middle-income students, guaranteeing that those whose families take home less than $30,000 annually would receive enough to cover tuition for four years. Students whose families earn up to $100,000 a year now receive annual grants ranging from $300 to $2,500. This is a great and necessary investment, particularly for low-income families for whom the university is otherwise inaccessible despite their children's merit. In the last six years, the number of needy students at UT-Austin — as measured by those who receive the federal Pell Grant — has decreased from 28 percent to 24 percent. When Tiffany Pham ranked in the top 7 percent of her high school class, she was near certain she would be heading to her first-choice college: the University of Texas at Austin. Less clear was how she would pay for it. A top student at a largely low-income high school, Pham was a cheerleader, and a member of the honor society — and she’d harbored an interest in studying nursing since her father was diagnosed with cancer. He died in 2014. Pham’s parents had assured her they would do “whatever it takes” to get her a university degree. There were savings tucked away, and Pham learned she would qualify for need-based financial aid. But once she "started doing the math," Pham said, she knew it wouldn't be enough. "It was like, ‘Oh my gosh! This is the price of a luxury car,'" she recalled last spring. “My goal was just to rack up on scholarships," said Pham, who grew up in South Austin. In Texas and across the country, more and more students are like Pham. Historically under-represented on college campuses, many are racial or ethnic minorities, economically-disadvantaged or first-generation college-goers and, over the last decade, UT-Austin has made a concerted effort to help those students graduate. Officials there have redesigned courses, added freshman peer groups, and re-hauled orientation. The school has seen a corresponding increase in its four- and six-year graduation rates. 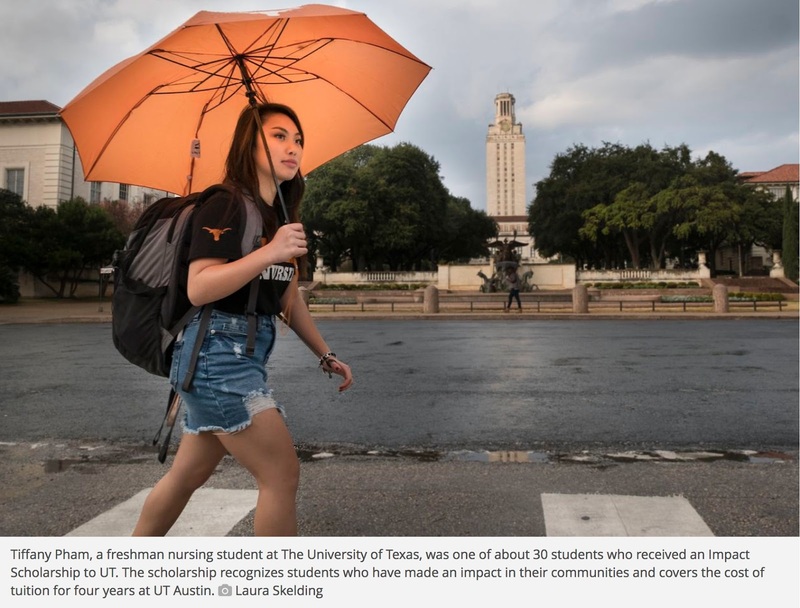 But most of the new programs come after students have committed to UT-Austin, meaning they don't reach applicants who were accepted and decided the flagship was financially out of reach. Data shows that high-achievers at largely low-income high schools are less likely to attend UT-Austin, even if they get in. Though the reasons are complicated, finances and fear of not fitting in play roles. Changing that has become a priority for the Austin flagship. It represents a shift in focus, from getting enrolled students to graduate to also getting more nontraditional students to enroll. The scholarships do not cover living expenses or textbooks which, for Pham, were estimated by the university to cost an annual $15,800. Out of UT-Austin's 40,800 undergraduates, 4,669 received some money through the initiative this year, including 775 whose tuition costs were fully paid. Among them was Pham, who answered the front door of her mother’s house in Dec. 2017 and was surprised to find a cluster of UT-Austin officials outside cheering and saying “hook 'em.” They presented her with a theatrically-oversized check for $48,000, or the cost of tuition for four years. Pham’s mother burst into tears. UT-Austin’s new financial aid initiatives are overseen by Hernandez, the senior vice provost, who joined the school in August 2017. Her role is new to the university. Hernandez manages the offices for financial aid, enrollment, registration, admissions and "student success" — a job that includes overseeing initiatives that began under David Laude, a chemistry professor tasked in 2011 with upping UT-Austin’s four-year graduation rates from 52 to 70 percent. Under Laude, the university added a series of academic and co-curricular support programs that targeted students at most risk of dropping out. UT-Austin’s graduation rate reached 69.8 percent last year, and Laude left his position as the so-called champion of the metric in 2017. Completion rates can be a proxy for success in college, representing how many students stay enrolled and earn a degree in a timely fashion. But it’s also a measure of cost-effectiveness. It can be financially ruinous for students to take on debt or carve out time for school, and then drop out without receiving a degree — or for them to pay tuition for more years than they need to satisfy their academic requirements. "I consider that outcome to be a disaster," said Tom Melecki, the former director of UT-Austin's financial aid office. Dropping out can leave students saddled with loan payments, but without the added earning-power that comes with a college degree. "Everybody loses — student borrowers, lenders, schools, future student borrowers, etc.," Melecki said. College completion is also central to the state’s strategic plan for higher education. Dubbed 60x30TX, the plan’s key tenet is to have 60 percent of 25- to 34-year-old Texans in possession of a certificate or degree by 2030, an aim that can’t be achieved without increasing the number of economically-disadvantaged students attending and graduating from college. 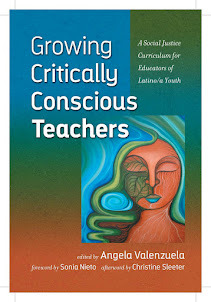 In theory, the initiatives overseen by both Laude and Hernandez align with the 60x30TX goal. Laude’s changes helped more students graduate. Hernandez’s could encourage more students to attend by removing a financial roadblock. In the last six years, the number of needy students at UT-Austin — as measured by those who receive the federal Pell grant — has decreased from 28 percent to 24 percent. With one year of data, it’s too soon to tell if or how the new financial aid will change that. "I still don't want to be a burden"
But whether or not the scholarship changes campus diversity, UT-Austin officials say it's bound to have a positive effect on students' performance in the classroom. A growing body of research has found low-income students make financial sacrifices that bleed over into their academic lives, and that even modest amounts of money can stand in the way of students graduating. "People can't work their way through college anymore," said Melecki, the financial aid expert. He listed a half-dozen problems that being underfunded can bring on, from forcing students to skip meals, work part- or full-time jobs, or not purchase textbooks. Students' grades suffer as a result, or they could drop out, Melecki said. Hernandez, the UT-Austin official, said the university measures success by graduation rates but that a "real goal is to make sure that students have the ability to take full advantage of the opportunities here — both inside and outside of the classroom." "Increasing financial aid is part of that," she said. "We want students to worry a little bit less about having to work outside of a typical realm for students and to be able to focus on taking advantage of the resources that we have here." Part of UT-Austin's new scholarship money, some $5 million, comes from the system's endowment, one of the richest in the country with a value that reached $31 billion last year. The $12.5 million in new financial aid represents an increase for the university, which gave about $63 million in total undergraduate aid last year, though it is smaller than similar programs at other schools. In addition, families with incomes below UT-Austin’s $30,000 threshold are often already eligible for government grants. The university’s new aid comes into play after students have exhausted those outside sources. For Pham, that included a $5,900 federal Pell grant, $1,600 in state funding, and a $7,500-a-year scholarship from a medical foundation. Though Pham's tuition was covered by the UT-Austin scholarship, she still spent the months before her freshman year worried that there were expenses her grants wouldn't pay for. In May, she wondered if her financial aid would cover housing. Would she be placed in a dorm that surpassed what her scholarships would pay? She told a reporter she was planning to call the financial aid office for reassurance. In August, Pham found herself making lists of all her expected expenses — housing, groceries, textbooks — trying to account for every dollar that might not be covered. Her mother, also weighing the costs, asked Pham if she would need to contribute. Pham was lucky. In the end, her entire cost to attend college was paid for by her different scholarships and grants. When she called a reporter in October to give an update on college, her concerns were primarily academic.